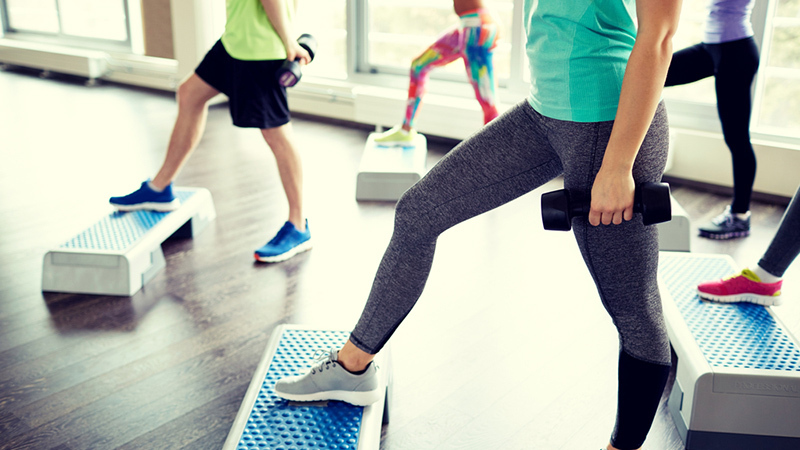 Functional strength is the strength we use every day to complete regular tasks, like carrying groceries or walking up several flights of stairs. Being functionally strong allows you to be more flexible, have better stamina and adapt to any physical challenge more easily. Think about it this way: If a muscle-bound weightlifter and a lean, functionally strong person ran an obstacle course with a variety of challenges, each of them requiring different muscle groups and speeds, the functionally strong person would perform optimally better. That’s because rather than working out for purely aesthetic reasons, increasing functional strength means your body is better able to handle physical situations with greater flexibility and endurance. The good news is, it doesn’t have to be one or the other. You can lift weights to gain muscle mass and be functionally strong. The key is finding the right balance. Next time you’re in the gym, try these five dumbbell exercises specifically designed to improve functional strength. This exercise strengthens your legs as well as your back and shoulder muscles. Plus, it will improve your balance, which is critical for functional strength. Hold a dumbbell in each hand by your sides, starting in a standing position. Step forward with your right foot and lower yourself down to the ground until your right leg forms a 90-degree angle. Keep your chest and head straight, and keep your feet in position as you lower yourself. Return to a standing position, forcing your weight through your right heel. Repeat 10 to 15 times for each leg. Squats are widely considered the best full-body exercise you can do, because they work so many different muscle groups. Goblet squats will help you improve your balance, bone density and overall strength. Stand with your feet a little wider than shoulder width apart and hold a dumbbell at your sternum, the center of your chest. Squat down, keeping your back straight and dropping your elbows to the inside of your knees. Keep all of your weight on the balls and heels of your feet – test this by making sure you’re able to wiggle your toes while you squat (even though wiggling your toes isn’t part of the exercise). Focus on your core while you squat, and exhale as you return to the standing position. Great for back strength, bent-over rows will help your upper and lower body work better together, and they’ll give your biceps a boost too. Repeat 5 or 6 times, and then switch to the other side without resting. Step-ups tap into a motion you probably do every day: climbing stairs. This exercise will improve your climbing endurance and stamina, and strengthen your quads and glutes. Stand in front of a bench, holding a dumbbell in each hand. Place your left foot on the bench (the whole foot, not just the ball) and lift yourself up by driving through the heel of your left foot until your right foot is up on the bench as well. Carefully lower your right foot back to the floor while maintaining your balance, keeping your head and back straight. Repeat 10 to 12 times for each side. If you want to add some difficulty, perform a double bicep curl at the top of each step. You can do this exercise while sitting or while standing for a more effective functional strength workout. If you stand, you’ll be engaging your abdominals to help you balance and stabilize, which will encourage full-body strength. Sit on a bench with a tall, flat back and hold a dumbbell in each hand, just above shoulder height with your palms facing forward. Push the dumbbells straight up into the air until your arms are above you, fully extended. Bring the dumbbells smoothly back down to shoulder height without stopping at the peak of the motion.